Posted on 31. Jan, 2011 by Mike Fieldhammer. 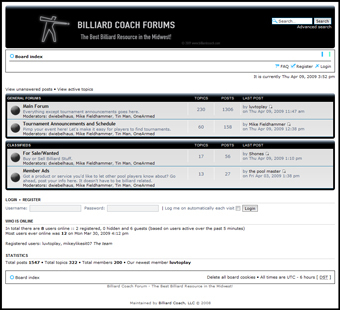 Billiard Coach Blog. You are here. Tournament talk, results, and lively discussions. Please consider my goods and services for your next billiard related equipment purchase or pool lesson. I sincerely hope you’ve grabbed some educational, inspiring, or entertaining material from this month’s series of articles. If so, please consider taking a lesson, buying some pool gear, or tossing a small donation my way. I’m available for lessons/coaching by appointment and I’m compiling a list of some special deals on cues for a February Blowout Sale. Please contact me if you’d like me to email you a private preview of some of the bargains coming up. 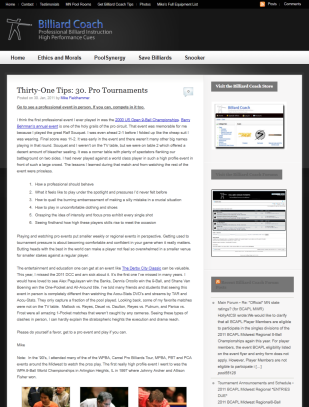 Maintaining this blog and the forums takes time and money. I’m happy doing it, but I too must make a living. Thank you to all of my clients who’ve taken a lesson and/or bought any products from me. I hope you’re happy with your purchase. If you are, please pass along the news of your experience to someone you know. Referrals are very important to my growing business. Thanks again. To wrap up this month’s marathon of articles, here’s a piece I authored for the American Cuemaker’s Association. Why buy an American made cue? America has a long tradition of cultivating craftsmen and artisans. Modern cue making innovations were pioneered in the United States and we have a rich history of woodworkers, machinists, and players veering course and developing into full time cue makers. The American Cuemaker’s Association celebrates the craft by honoring the year’s best achievement in cue building with annual awards at their banquet each March. Players and cue collectors around the globe reap the benefits of the ever advancing art and science of cue making. Beauty, performance, and artistic vision meld with a magical quality to become the wand that pockets balls with beautiful precision. Cue makers who belong to the ACA deserve a pat on the back and a buck in their pockets for keeping players in top gear. The association was founded in 1993 by a group of guys whose goal is the same now as it was then. 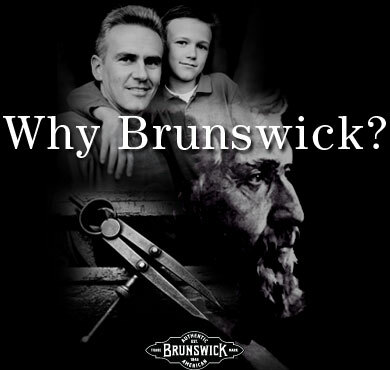 In essence, they wanted a trade association for American cue makers that meet a high standard of quality in their cues and conduct business in the highest ethical manner. As many players who have bought cues from an ACA member can attest, the process and the product can be exhilarating and a source of pride and joy to use for years and years. The technical prowess of an ACA member is a certainty. Other trades have a system to signify proficiency and experience with terms like apprentice, journeyman, and finally master craftsman. One could think of the ACA as those cue makers who have reached the master craftsman level. Samsara 8 point pool cues. Some cue wielders relish the chance to spec out a weapon of exacting details to bring out their best game. “I’d like a strong taper, ivory ferrule, lizard wrap, 3 shafts, and 19.3 ounces please.” Others have a certain look as their primary concern such as certain color veneers, white with brown spec linen wrap, and a Hoppe ring, with no rubber bumper. No matter what your preference is, you’ll probably find just the right artist for your dream cue within the ACA. Meeting face to face or by a series of phone calls and email exchanges, ACA members take pride in their customer service and will be happy to have you contribute to the design process. Follow up service can be just as simple and pleasurable, if necessary. ACA members have a reputation of taking care of their customers. Discuss the warranty with your ACA cue builder. They are members of the ACA because their product meets a certain build quality that is reviewed by a panel of cue experts. This is one of the criteria each member has passed to gain entry into the ACA. After the sale, follow up is also top notch. Decide to change the weight or get another shaft as a spare? No problem. ACA cue makers are likely to be within a couple of time zones of your local time and are easy to reach. Shipping and delivery times are generally reasonable and you don’t have to worry about the cue being subjected to a transoceanic flight or boat ride. Since wood still breaths and moves, minimizing environmental effects is important. ACA is kind of a better business bureau for cue builders. You can bet that members of the group have been making cues for many years. Even freshmen cue makers in the ACA have probably been making cues for ten years of longer. The craft is so specialized that it can take years to attain a reputation and the skills to build a product worthy of entry into the American Cuemaker’s Association. Similarly, it is likely that your cue builder will be around for many, many years to come. Making a living building cues is just as difficult as making a living playing pool, yet most ACA members do it as career. Passionate, experienced, and highly skilled, these elite cue makers have found a way to make their love of cue making into a lifelong devotion and way of life. Brand new Limited Series Samsara D-12. In Stock. “Made in the USA” and “Buy American” are slogans and bumper stickers that have been floating around for years. In these days of economic crises, they ring as true as ever. Think about cue makers in the following statements. “When you buy goods made in the USA, you help keep the American economy growing.” This certainly applies. Even more true when you think about many Cuemakers who started in another’s shop and eventually spun off to become a well known solo craftsmen. Or the tradition of passing the cue shop down to the next generation of sons and daughters. “When you buy only American-made products, you insist on a higher standard.” Also true, ACA cuemakers raise the bar for cues made in the USA and around the world. If cuemakers disappear across the country, quality could slip as the competition dwindles. Buy American and help keep your friends and neighbors – and even yourself – earning a living wage. Imports won’t have to strive for high quality to complete. Next time or any time you think about buying a new cue, consider buying American. American Cuemaker’s Association, that is. You’ll be supporting a rich history of American craftsmen dreaming up revolutionary designs for essential equipment to pocket balls in a centuries old game. In return, you’ll get a cue that will have the ACA member stand behind. It’s their profession. Mike Fieldhammer is a full time tournament player and professional billiard instructor. Mike’s team “Who Needs a Billiard Coach? !” recently won the BCAPL National Team Championship in a field of 674 teams. He also is a cue collector beginning with a Bert Schrager purchased while still a broke college student in 1990. 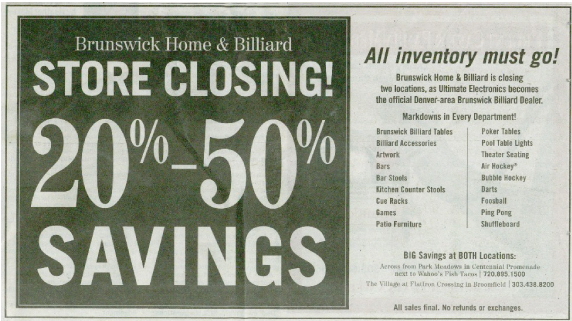 Lessons, gift certificates, and some collectable cues are available at the Billiard Coach Store.